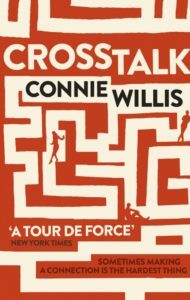 Connie Willis at her best tells tales of engaging characters in surprising situations and then lands an emotional blow that can still be felt a decade or more later. I can’t, offhand, think of another author who has done what Willis does two-thirds of the way through Passage. When she’s merely very good, Willis can do anything from a romp to a heartfelt sideways look at people and research, or a screwball comedy trying to get out of a Hollywood dystopia. Even Willis that I think ought to be pared down a great deal offers lovely moments, and a strong ending. 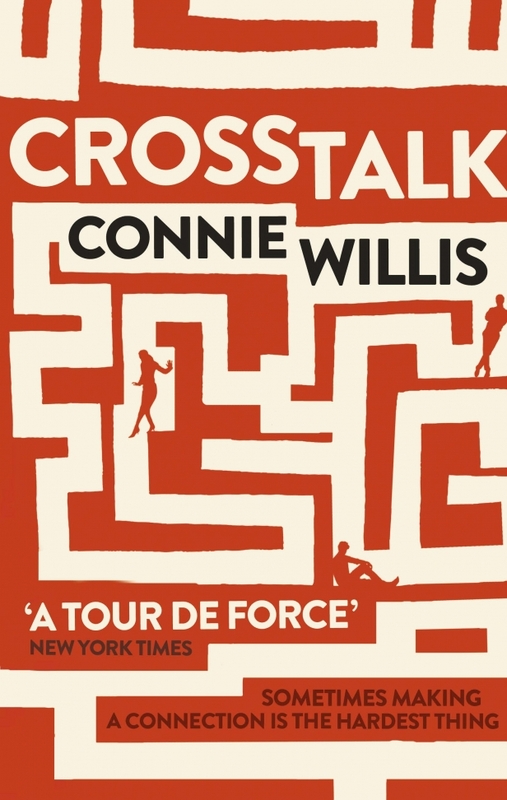 Crosstalk ramps up the madcap, throws in a good bit of family, and leavens it with some interesting almost-here tech crossed with the all-too-believable speed and dysfunction of the contemporary tech industry. Briddey Flannigan is a manager at Commspan, a telecommunications company that feels a lot like the labs in Bellwether. Lots of people are very busy, but only a few are actually getting things done. Briddey, as Willis refers to her throughout the book, is in middle management, and is romantically involved with Trent Worth, a senior vice president. The company is a fishbowl of intrigue and gossip, but that’s nothing compared to the intrusiveness of Briddey’s family. They are a large and loud Irish-American clan, with everybody up in everybody’s else’s business, particularly some the aunts who promote an Irishness that people from actual Éire would be hard pressed to recognize. The latest rage in this near-future world is the EED, a supposedly minor surgical procedure to implant a device that will enhance an emotional connection with someone who has received a matching device by enabling direct transmission of feelings. It’s not meant to be telepathy, but the next best thing. As Crosstalk opens, Briddey and Trent have just agreed to get implants, presumably as a prelude to marriage and happily-ever-after, along with all the fruits of success at Commspan. Things go wrong, of course. Briddey starts hearing voices, not just the vague feelings the EED is supposed to transmit, and the one voice she is definitely not hearing is Trent’s. The product Commspan is supposed to release next is meant to connect people along the lines of the EED, but if the implants work so strangely for Trent and Briddey, then the company’s plans to steal a march on Apple could come crashing down. And all the while Briddey’s family keeps butting in with worries, concerns, news and views about everything except what’s worrying Briddey. More crosstalk. The din gets louder and the book gets faster until, at the end, Briddey figures out what’s going on and what she wanted all along. The ending is not a great surprise, but getting there is quite fun. It’s warm, sometimes zany, sometimes tart, and in the end the signal comes through on a clear channel. Writer, editor, translator, project manager, reformed bookseller. Currently based in Berlin, following stints in Moscow, Tbilisi, Munich, Washington, Warsaw, Budapest and Atlanta. Also blogs at A Fistful of Euros, though less frequently than here these days.